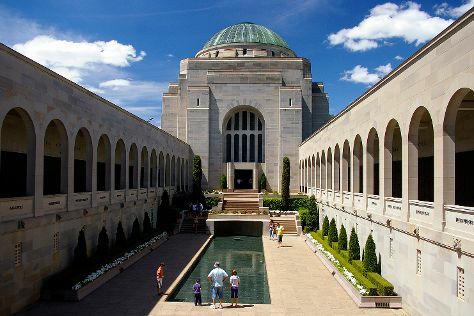 Get a sense of the local culture at Australian War Memorial and National Gallery of Australia. Your inner history buff will appreciate St John the Baptist Church and Canberra Rotary Peace Bell. The adventure continues: identify plant and animal life at Tidbinbilla Nature Reserve, admire the masterpieces at Drill Hall Gallery, contemplate the waterfront views at Lake Burley Griffin, and admire the natural beauty at Australian National Botanic Gardens. To find reviews, other places to visit, photos, and more tourist information, go to the Canberra travel route planner . Bengaluru, India to Canberra is an approximately 20-hour flight. You can also do a combination of flight and bus; or do a combination of train and flight. The time zone difference moving from India Standard Time to Australian Eastern Standard Time (New South Wales) is 4 hours. Prepare for much colder weather when traveling from Bengaluru in May: high temperatures in Canberra hover around 19°C and lows are around 2°C. Cap off your sightseeing on the 18th (Sat) early enough to go by car to Beechworth. A town that appeared during the gold rush in the 1850s, Beechworth is a well-preserved example of Victorian expansionism. Start off your visit on the 19th (Sun): stroll the grounds of Beechworth Public Cemetery, then appreciate the extensive heritage of Beechworth Historical Precinct, and then learn about winemaking at Brown Brothers. Keep things going the next day: examine the collection at Burke Museum, contemplate the long history of Beechworth Telegraph Station, contemplate the long history of Beechworth Gaol Unlocked, get engrossed in the history at Beechworth Historic Courthouse, then look for gifts at Kathryn Hammerton Beechworth, and finally do a tasting at Eldorado Road Wines. To see maps, traveler tips, more things to do, and more tourist information, use the Beechworth trip planner. Traveling by car from Canberra to Beechworth takes 4.5 hours. Alternatively, you can take a bus; or fly. In May in Beechworth, expect temperatures between 19°C during the day and 5°C at night. Cap off your sightseeing on the 20th (Mon) early enough to travel back home.